Last week, I shared how our first consulting session went for our future shop! Jeff, from the Denver Small Business Development Center shared some great start-up information, one of them being to get into the coffee industry asap. I’ll admit, we were thinking of just getting an espresso machine and learning the trade ourselves, but I’m so thankful I took Jeff’s advice. Aside from learning how to make quality drinks, you also learn countless important things about keeping a coffee shop that you can only learn by working at one. However, I was surprised to see how many coffee shops are looking for baristas that have already been working at least a year! So my first question was, how can I get a job at a coffee shop without any experience? I started to research this question hoping to find some tips, and hardly anything came up. So in case you have the same questions I did, I’ve compiled some basic things that have been helpful to me in this upcoming week’s three-part series that I will be posting. I hope they can be useful if you’re pursing a barista position or a job in the coffee industry and have no idea on where to start. Naturally, a lot of shops do want to hire people with coffee or food service experience. They already have a feel for the pace of the job and know how to work in a fast environment while providing exceptional customer service. One coffee shop owner I talked to recently said he’s pretty strict on hiring people with experience because they have a feel for these things. However (there’s hope! ), he said he’d take someone with no coffee experience but with a great attitude over a skilled barista with a sour personality any day. As I was looking for barista openings in my community, I started to get a feel of some skills to have to succeed as one. Knowing these skills are important. You want to make sure you’re a good fit so that YOU can enjoy the job and succeed at what you’re doing, and so you can benefit your job and THEY can enjoy you as an employee also. With any job, you don’t want to apply if you’re not a good fit; not only will you be unhappy, but your attitude will affect those you’re working with as well. At least you know how to be around people. This includes being friendly and relatable. You want to engage with customers, as well as enjoy working with your team. You want to be personal, but also professional, realizing you represent the company! I mean… how many of you have never gone back to a coffee shop because your barista was rude? Or have continued going because they were friendly? You’ll be hired to make drinks and keep up with orders, and the faster and more efficient service you provide, the more customers you’ll be able to serve. And customers will want to return to a place which provides quality coffee in a quick manner. Thus, you must have a high work ethic and be willing to work hard. You should be comfortable providing quality work in a fast-paced environment, and self-motivated to see and do what needs to be done around you. Being a barista really is a lot of work, and you have to be willing to do it. You could read and write tons of articles on customer service, and I’m pretty sure you can conclude the importance of being customer focused and putting their needs first. A good barista does just that—puts customer needs first and wants to make people feel special and surpass their needs. You care about serving others in the day-to-day, as well as developing long-term relationships. Cleanliness and sanitation is very important in the food industry. 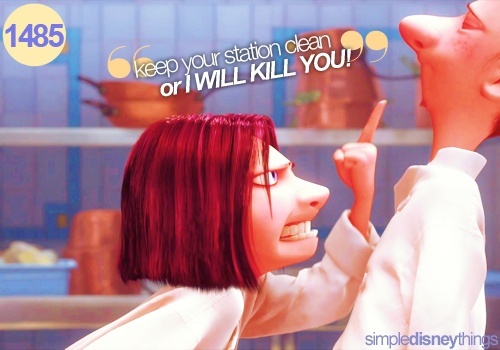 As Colette says in Ratatouille, you must keep your station clean!! Having high standards of hygiene and keeping areas clean is a great trait to have. Organization wins over sloppy carelessness any day. You’re humble, and ready to learn and improve. You’re willing to adapt your new job’s standards of doing things, leaving a know-it-all or superior attitude at the door. You’re always looking for ways to improve yourself, to be the best you can be, and you take responsibility and pride in growing and achieving in your accomplishments. You want to learn what you don’t know, as opposed to giving up on yourself or thinking you’re fine as you are. As a freshly new barista to the coffee industry, this list is by no means extensive or exhaustive! However, these are traits that have come up over and over in various job postings, blogs, forums, and articles when it comes to getting a job as a barista. It will help you if you know what coffee shop owners are looking for! As a given you should also have a love for coffee, or a desire to grow your love for coffee! With anything, you must love what you do to be successful in it. However, if you’re new to the industry –as I am– I want to encourage you that attitude and character go a long way in getting hired, even without being a coffee expert or connoisseur. I believe a good attitude and a kind and genuine character is one of the biggest things coffee shop managers are looking for. Owners and employees really do want to work with people who are happy and enthusiastic, and want customers to see that you love your job and love serving them. They want to see you work well with others, and that you can interact and spread the cheer to everyone who walks in the door. An article I browsed upon that was written by a coffee shop owner mentioned that ATTITUDE is everything, and he often fires his baristas the moment they lose their smile. If you want to be a barista, LOVE what you do, and people will love you too! Be flexible. An easy to work with attitude, and a flexible schedule helps! These are the top things I found employers are looking for in a barista—other than having direct coffee experience. What do you think? Can you get a job based on character and attitude alone? Keep on the look out for more tips on becoming a barista without coffee-related experience that I’m discovering in my journey– hope they help you too! Past/Current barista’s and coffee shop employers: what other traits would you say are important to be a barista? Does a good attitude and personality trump having experience alone? What are your thoughts? Hello there. I'm Julia, and welcome to Dream|a|Latte. Here you'll find our adventures in starting a coffee shop, from the birth of this once-impossible dream, to the opening day of SONDER Coffee & Tea. The story continues as we dare to discover the unknowns that await us ahead!